Cover options for the May/June issue of Canadian Geographic. 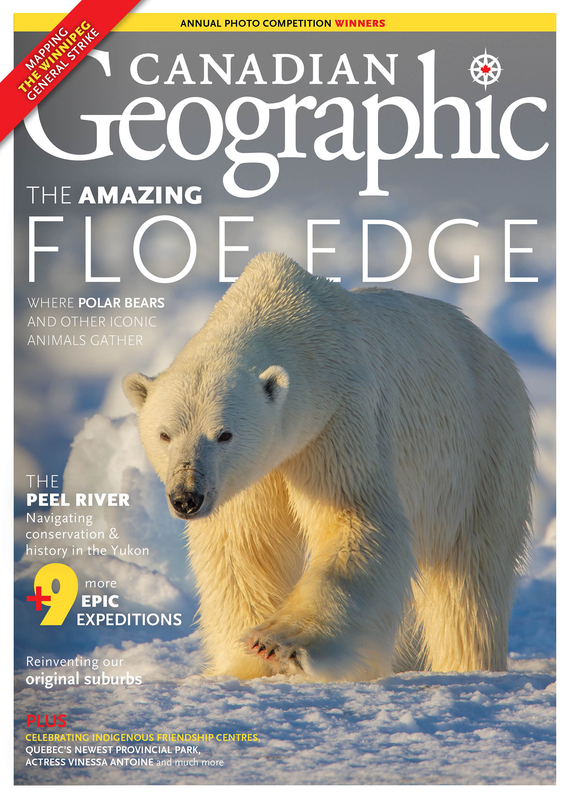 There’s a general rule at Canadian Geographic that readers love polar bears. More than practically any other animal, they stir feelings of awe in nature. People travel thousands of kilometres and at great expense to see them in the wild. They inspire calls for habitat conservation and climate action. They sell covers. We had an idea, then, that even if we pitted two other magnificent examples of eastern Arctic floe-edge megafauna — a walrus and a bearded seal — against Ursus maritimus in the cover vote for our May/June issue (Can Geo regularly solicits feedback from its followers in this way), that the bear would maintain its status as apex species. It did, and with nearly half the total vote count. And what better way to illustrate a cover story about life at the floe edge in Lancaster Sound, Nunavut — where landfast ice meets open Arctic Ocean and species thrive in a complex web? One problem: further research into the winning photo’s origin revealed that this particular polar bear was, unexpectedly, from the Western Hudson Bay population, which reside well south of the Arctic Circle and about 1,700 kilometres south of the floe edge in question. This bear would not do. We use our cover vote results as something of a compass, weighing this data from thousands of readers along with the instincts of our publisher and editorial team and the advice of newsstand consultants. We knew our audience should have their great white bear. So our photo research team worked with Canadian wildlife photographer Todd Mintz to secure an image of another majestic specimen, this one spotted around the floe edge off northern Baffin Island — stalking the ice with what looks like deadly focus, a few scars visible across its muzzle. This new polar bear, we’re sure, will similarly impress our subscribers and readers at newsstands across the country. If you don’t already receive our cover vote email but want to, simply click here and sign up for the Canadian Geographic newsletter. And if you’re not a subscriber already, be sure to get your copy of the May/June 2019 issue of Canadian Geographic by subscribing today.